Wheat harvest in El Centro, California. Photo Courtesy of the United States Department of Agriculture. Photo by Tim McCabe. Wheat is used to manufacture food products such as bread and other bakery products, cereal, spaghetti, and beer. Leftover wheat stalks are used to feed animals. About three fourths of all harvested wheat is "winter wheat," which is planted in the fall. The state of Kansas produces the most wheat in the nation. Wheat is not native to North America. It was brought from Europe and was first grown in the Untied States in 1777. However, it was not grown as a serious food crop until the late 1830s in Kansas. In the 1870s, a Russian strain of wheat was introduced in Kansas when 5,000 Russian immigrants settled there. Later the United States Department of Agriculture (USDA) introduced new wheat strains from Eastern Europe to Kansas and other Great Plains states. The Russian and Eastern European wheat strains provided the basis for wheat breeding in the U.S. until the 1970s. 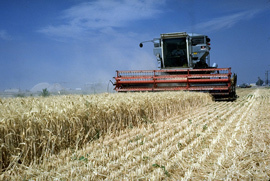 Click on PICTURES below to see additional photo of a wheat harvest in Akron, Colorado. Click on MAPS below for additional facts about wheat.